Facebook is one step closer to finally beaming Internet down from space. Facebook (FB) will use the satellite to bring free Internet access to rural areas. The company is using satellites, lasers and drones to get the "next billion" people around the world online as part of its Internet.org initiative. It has already connected people in nearly 20 countries. 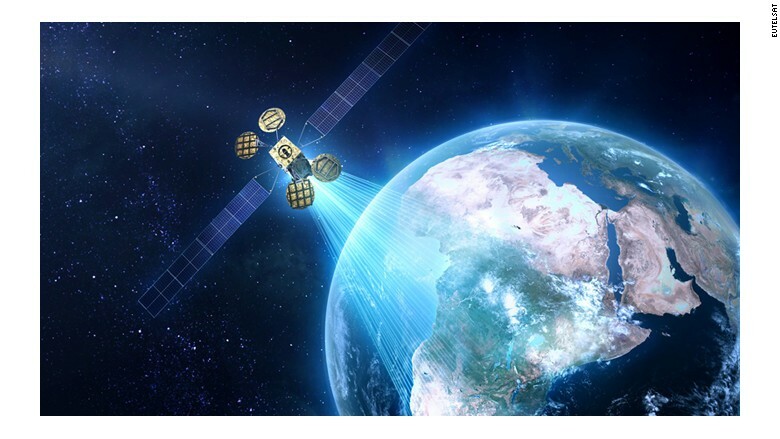 "Facebook's mission is to connect the world and we believe that satellites will play an important role in addressing the significant barriers that exist in connecting the people of Africa," said Chris Daniels, VP of Internet.org, in a statement. Facebook and Eutelsat are leasing the AMOS-6 satellite from Israeli company Spacecom. The two companies will share the satellite and use it for their own individual services. Eutelsat will expand its paid broadband connections in the region for businesses and well-off individuals. Internet.org has been criticized for limiting what services people can access through the free smartphone app. It currently includes free access to 60 services, including health and finance tools and, of course, Facebook. The app was recently renamed "Free Basics by Facebook" in an attempt to distance it from other Internet.org projects. In May, Facebook launched an platform so third-party developers could develop their own services for Internet.org. In July, Facebook unveiled a new custom drone it is building to bring internet to hard-to-reach and underserved locations. Other companies are also racing to bring low-cost, low-bandwidth Internet to the world. Google is working on Project Loon which uses hot air balloons.